2018 FIFA World Cup is going to be the 21st FIFA World Cup, which will take place in Russia. To be exact, this event will happen in 11 different cities – Moscow (finals), Kaliningrad, Saint Petersburg, Volgograd, Kazan, Nizny Novgorod, Samara, Saransk, Rostov-on-Don, Sochi and Ekaterinburg. There will be 32 teams participating in this quadrennial international football tournament. Moreover, organizers of FIFA World Cup are expecting over 1 million people to come and watch the tournament in Russia. 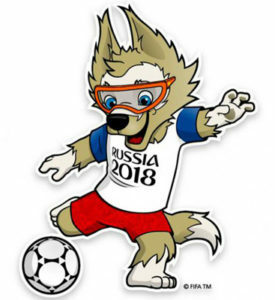 The official mascot of 2018 FIFA World Cup is Wolf Zabivaka (“zabivaka” translates from Russian as the one that scores), chosen by online voting, was designed by a student from Tomsk State University – Ekaterina Bocharova. How’s Russia preparing for 2018 FIFA World Cup? More than 660 billion rubles were allocated for the championship, 336 of which come from federal budget. In addition, 30 billion rubles were reserved for providing security during the tournament. Around 12 stadiums and 113 training platforms are currently being built and reconstructed. Over 60 hotels (10000 rooms each) are being built in the 11 host cities. Furthermore, a new airport might be built in Rostov-on-Don as the current one is surrounded by buildings, and it would be impossible to further upgrade it. About 15000 volunteers will take part in the events of World Cup. Those are carefully trained and selected volunteers from all over the world. All volunteers must speak English fluently, be above 18 years old and, of course, work well in a team. The volunteers will work and provide support in such areas as organizing the ceremonies and other events, transportation, media, language services, doping control, and fan services. FIFA Fan Fests, public viewing events, will be organized for all those who cannot get the tickets or make it to the stadium match. Most of the picturesque venues are already announced and reserved in all of the 11 host cities. Each iconic venue will have the capacity of 10000 people or more. FIFA Fan Fests will not only be about public screening of the matches, but will also offer their fans a rich entertainment program. Fans will be able to enjoy various performances by famous musicians, different exciting activities and interactive stands. The entrance to fan fests will be free of charge. Is 2018 FIFA World Cup going to be safe in Russia? There are no doubts about the safety of the teams and fans during the tournament. As proven already, it was completely safe and secure during 2017 FIFA Confederation Cup, which has also happened in Russia – more specifically in Saint Petersburg, Kazan, Moscow and Sochi. Moreover, 2017 FIFA Confederation Cup was an absolute success overall. All visitors, including the team members, were amazed with Russian hospitality and Russia as a country. There will be many security measures taken during FIFA World Cup 2018 such as changes in the migration registration for everyone (foreign citizens, stateless persons and citizens of Russian Federation). Moreover, these changes will include traffic and aircraft movement restrictions. This entails the creation of controlled and restricted zones and procedures to access them. All World Cup stadiums are being equipped with new modern security systems. This will ensure safety and order in the stadiums. In addition, President Putin advocated a federal law on administrative responsibility for the control of spectator at major sports events. The bill had been approved in April. This law doubles the financial penalty for breaching a stadium ban, and also introduces new punishments for “gross misconduct by spectators during official sporting events.” “Gross misconduct” means anything that threatens health, life or security of persons in the venue of sports event or surrounding areas and anything that might cause the termination of a sport event. The punishments could mean jail for 15 days and even expulsion from Russia. All well-known troublemakers will be banned from entering Russia altogether. Special things about FIFA 2018 World Cup? There are quite a few new innovations that are planned to be implemented during the 21st FIFA World Cup in Russia. 1) Special payment wearable rings or bands for the fans. What is greater than a cashless way to pay? Exactly! Nothing. 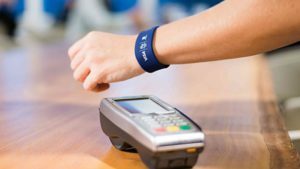 VISA, as the official payment service of FIFA, has invented payment wearable bands and rings for the fans to make their experience more fun and exciting. Some of these cashless wearables were already introduced at the Olympic Games in Rio 2016, and proved to be a success. Alfa-Bank and VISA are launching a special FIFA 2018 World Championship card for their clients in Russia. This will allow the cardholders to receive all kinds of bonuses and promotions for the FIFA 2018. One of the bonuses is that you will receive points, which you can later exchange for tickets or other purchases during FIFA 2018. 3) Fan-ID is a must! Every single spectator is required to have a Fan-ID during the FIFA 2018. Children must also have a Fan-ID! What is it? Basically, it’s a plastic card with your name, photo, personal details and contact number. How can I get it? Getting it is easy! Just go to Fan-ID portal, and, if you already bought the tickets, get your Fan-ID. Even if you have multiple tickets for different games, you only need one Fan-ID. 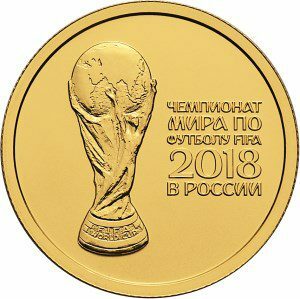 Bank of Russia released a series of commemorative coins for FIFA 2018. Four silver ruble coins each have a unique design depicting landmarks around Russia. On the reverse side of each coin there is an image of a football player with a ball, folk décor, and famous landmarks from Russian cities. There will also be a 25 rubles coin made from non-precious materials. If you want to be part of this exciting sport event ENQUIRE now for our group and bespoke packages to Soccer World Cup in Russia.